The phases of the Moon represent the illuminated fraction of the Moon´s surface that an observer on Earth is able to see at any given time. As the Moon orbits the Earth, the sun´s light always illuminates half of the Moon´s surface, but an observer on Earth is only able to see a small fraction which augments during the course of 15 days after which the Moon gets completely lit, as seen from Earth. During the course of another 15 days, the Moon´s lit surface gradually decreases while going through its phases until it reaches its new Moon phase. The Moon´s phases occur due to the angular alignment that the Moon, Earth, and Sun take in the sky. The Moon gets illuminated due to the reflectivity of its surface. It takes approximately 29.530589 days or 29 days, 12 hours, 44 minutes, and 3 seconds for the Moon to go through all its phases in what is known as a lunar month. During the course of a lunar month, an observer on Earth sees that the surface of the Moon presents surface changes which go from not being completely illuminated, to be partially illuminated, and reach a fully illuminated surface by the first half of the lunar cycle, then the cycle continues backwards from 3/4 of its surface illuminated to half its surface illuminated to partially illuminated, and not visible again at the end of its lunar cycle. 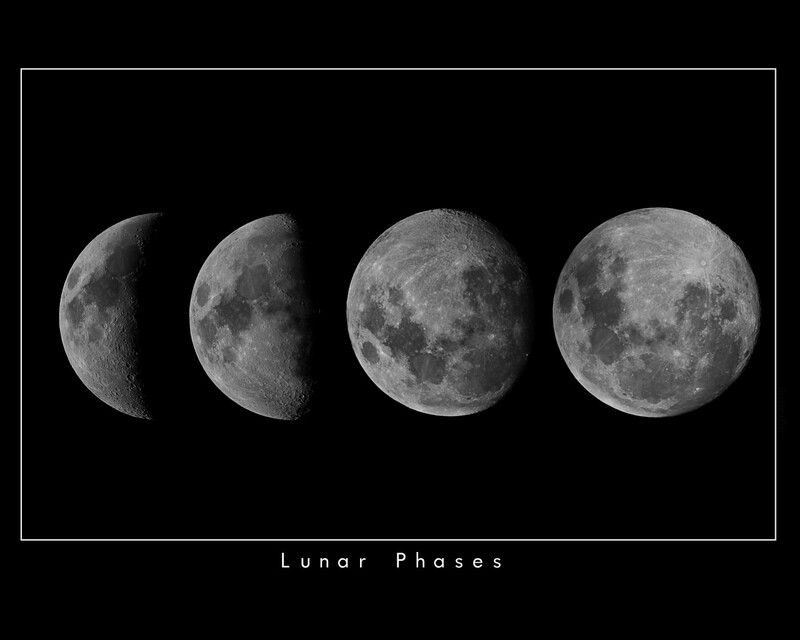 throughout the lunar cycle, astronomers have assigned eight distinct stages which are known as the phases of the Moon, and which designate both, the angular measure and the geometric appearance of its illuminated surface. During New Moon, the Moon is in a 180° angle with respect to the Sun. The Moon is in its closest distance to the Sun, situated between the Earth and the Sun. The side facing the Earth is not visible because it is not illuminated by the Sun; however, one side of the Moon´s surface (the far side of the Moon) is completely illuminated by the Sun. As the Moon begins its orbiting cycle around the Earth, a fraction of its surface appears illuminated, increasing gradually each day. By around 3-4 days, the Moon reaches its crescent waxing phase which is when 1/4 of its surface appears illuminated as seen from Earth. This corresponds to the first phase of the Moon. The Moon continues waxing (visibly increasing) on its orbiting cycle around Earth, and by approximately 7-8 days, it reaches its first quarter phase. At this stage, one half of the Moon appears illuminated as seen from Earth. It is called first quarter because only one quarter of the Moon´s entire surface is illuminated as seen from earth, although one half of the entire Moon´s surface is always illuminated by the Sun. This is the second phase of the Moon. The lit fraction of the Moon´s surface continues increasing, and anywhere from between 10-11 days of its orbit around the Earth, it reaches its Waxing Gibbous (bulging) phase. The Moon appears to be 3/4 of its surface illuminated. This corresponds to the third phase of the Moon. By approximately 14-15 days, the Moon has reached its full Moon phase, and appears completely lit in the sky. The near side of the Moon, which is the side that is always facing the Earth, appears fully illuminated because it is directly facing the sunlight, and the far side of the Moon, which is the side that is never seen from Earth, is completely dark because it is facing in the opposite direction of the Sun. The Moon continues to show a fraction of its lit surface in backwards direction. 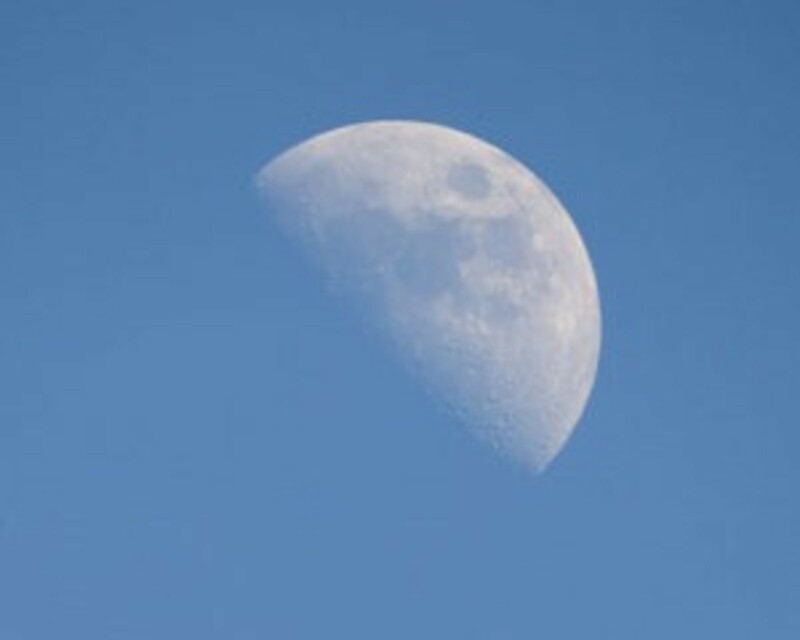 By around 18-19 days, the Moon appears illuminated on 3/4 of its surface, and it has reached the Waning Gibbous phase, which corresponds to the fifth phase of the Moon. The Moon´s lit surface continues decreasing and at approximately 22-23 days, one quarter of its surface appears illuminated by the sunlight. This is the stage known as the Moon´s third quarter phase (last quarter). This corresponds to the sixth phase of the Moon. At approximately 25-26 days, the Moon appears illuminated on only 1/4 of its surface as seen from Earth in the stage known as the Waning Crescent phase. This is the seventh phase of the Moon. After 29.530589 days, the Moon has reached its New Moon phase which is when the Moon appears completely dark as seen from Earth. 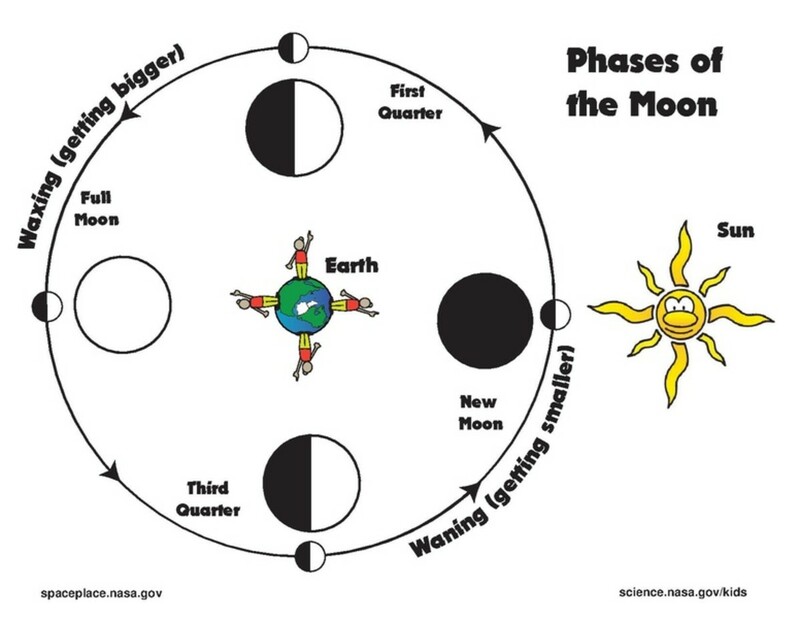 This phase corresponds to the eight phase of the Moon. The time it takes the Moon to complete one orbit around the Earth and the time it takes the Moon to rotate on its own axis is synchronized and corresponds to 27.3 days. That´s the reason a person on Earth always sees the same side of the Moon (the near side). The 23.5 days are measured with respect to the fixed stars on the sky; however, the Moon has to rotate around the Earth a little and make up for the almost one degree distance that the Earth has displaced on its orbit around the Sun to complete a synodic month (29.5 days) and complete its cycle of lunar phases. Astronomy is fun! It lets you study the planets, stars, comets,galaxies, and other celestial bodies out from the atmosphere of the Earth. 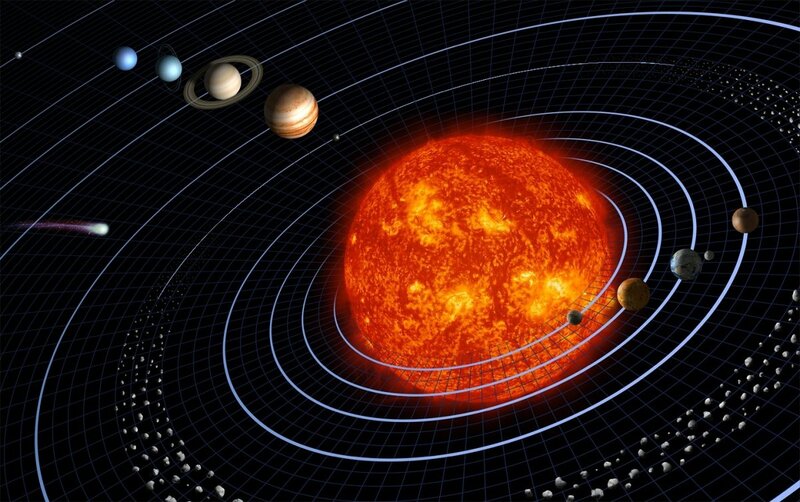 Solar system astronomy is one of my favorite science subjects. This is great. THanks. It takes the Moon 27.3 days to make a complete orbit around the Earth in what is called a sidereal month, which is the same time it takes the Moon to rotate on its own axis. These times are synchronized. That´s why we are only able to see on Earth only the near side of the Moon, and not the far side. the 23.7 days are calculated with respect to the fixed stars in the sky, not the Sun. The Moon has to travel a little bit further to reach its complete cycle of lunar phases (synodic month) which comprises 29.5 days. Trivia question: how long does it take for the moon to make a complete orbit of the Earth?